The fashion is not about the trend but it makes the difference with improving interest in traditional fabric and textile hues. Craze change drastically over time and not remain same as moons ago. In the modern era, dedicated designers redefine old cuts and showcase their designs in a distinct way that is suitable to the young generation. Diwali is just around the corner and most are still find the best dresses for the festival. Salwar Suits are perfect for this Diwali festival as it not only gives you comfort but also provide you festive appearance. Professional dressmaker comes up with designs that involve macro and micro level modifications. Teenagers are pairing Salwar Suit along with a jacket or styled dhoti and nowadays, its turn into pantsuit or isolated tunic with pant more than Salwar Kameez. Make your Diwali special by wearing unique structured patterns like Kameez with Sharara, Gown type dress, Lehenga with kameez, Kurta with Denim Jacket, Heavy embellished Anarkali Salwar Suit or Kurta with Jeans. 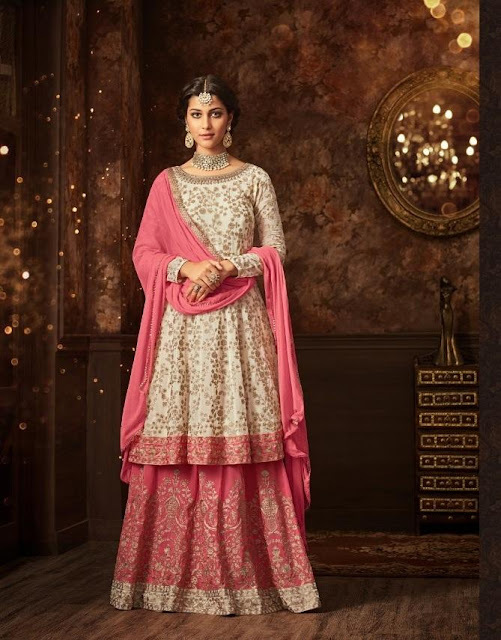 Are you looking for latest and trendy Diwali collections for Diwali party? 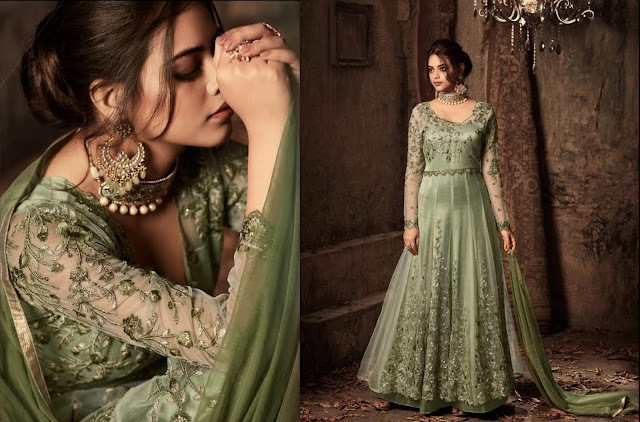 If yes, you are at the right place to check all festive wear collections online and surprise others by dressing Indian Diwali special designed outfits. Heavy worked Anarkali suit looks wonderful on bleeding edge. If you are searching for standard clothes for the festival, you should attempt this grey color floor length suit. Lady those are fair in complexion or peachy tones can choose this to look radiant. Satin silk floor length long gown type salwar suit with the long sleeve is on the creditable blend to look impeccable in function or event. Grey color Resham & hand embroidery work dupatta gives an exquisite interest to your appearance. Long earrings & open hairstyle suits with this dress. 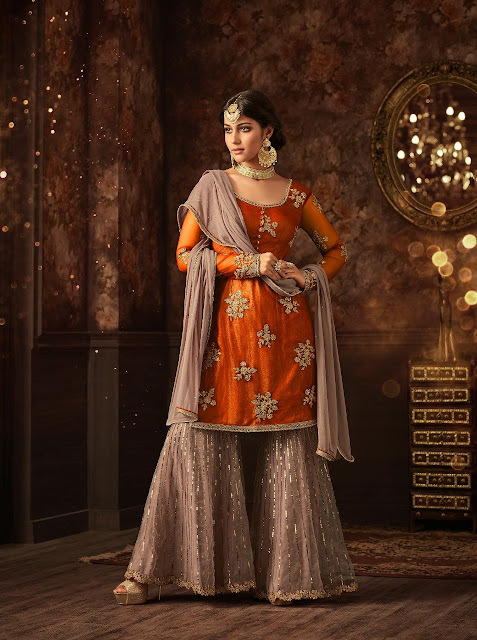 If you are looking for something different, orange color straight sharara suit is the best choice for this Diwali. Zari work bootie embroidery with a golden border on front side gives you a charming appearance. Pair it with light brown sequin work along with golden border sharara adds the grace. The black color is considered a formal and prestigious color that gives you a sophisticated look. Wear this heavy embroidered stonework georgette suit along with beige color net dupatta with heavy worked border and drape it from front to back and wrap other ends around the wrist. Use minimal accessory as it has heavy worked neck and full sleeve. The top is made up of georgette fabric with santoon inner and Zari, stone & thread work. Designer comes up with two patterns in the bottom. It can be made as sharara or lehenga style with georgette and santoon fabric enhanced with embroidery and thread work. Pink color chiffon fabric dupatta along with golden laces on border give an eye-catching look. 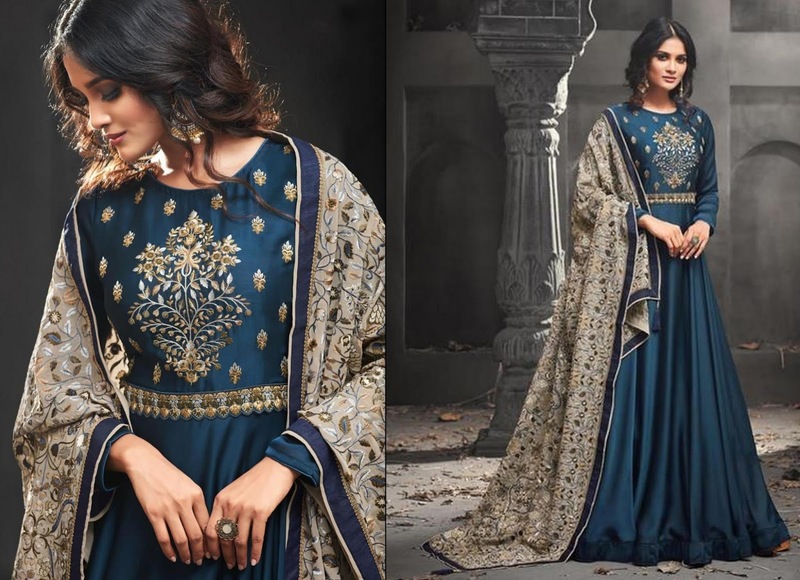 Heavy embellished embroidery work floor length salwar suit is an ongoing trend. This suit fits perfectly for those are slim and wish to look curvy in a styled. Dull polished golden accessories give an extraordinary glance. 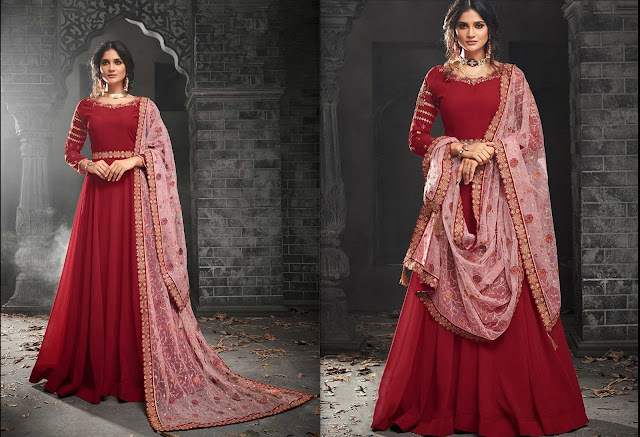 Drape the light pink colour net dupatta with heavy sequence red colour border in various way to look elegant. This light pink colour bridal wear suitable for any occasion like engagement, wedding or reception. Sheer neck net fabric with satin inner, thread work and rhinestone work on tops give substantial look. Chiffon fabric dupatta leriya design is an eye-catching combination with Salwar Suit. Long straight pink colour palazzo suit provides height illusion and smart look. 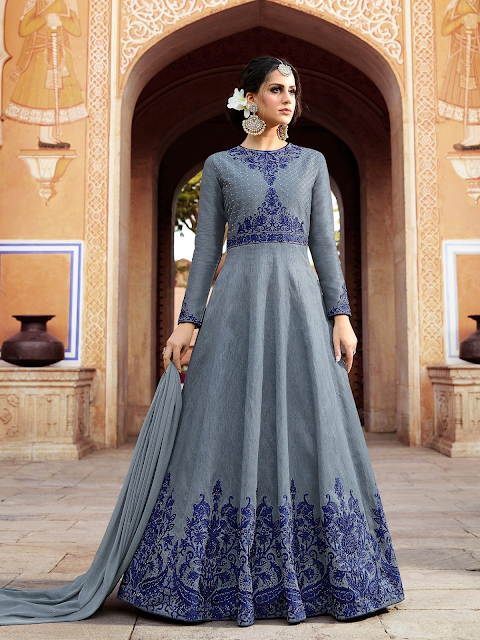 This suit is the best alternative for those are looking for a normal heavy dress for gathering function. Pista green colour is the shade of richness and it is associated with vitality. Green with heavy jewellery & messy bun hairstyle gives contrast look. Dhoti is the best choice who want sober and contemporary attire that gives comfortable look. It suits all type of the person whether they are pulpy or slim. Long earrings with Jutti and open hairstyle gives an eye-popping glance. You can visit our Indian Ethnic Wear Website to get the latest and designer collections. Shop now and get a benefit of the exciting deal with Worldwide Free Shipping.